While the Congress is facing anti-incumbency, the BJP is unlikely to be a factor in this state. Voting for the Mizoram assembly elections ended at 4 PM today with a 67 per cent voter turnout. Polling began at 7 AM and by 1 PM the turnout had reached 49 per cent. Within half an hour, the voter turnout reached the 50 per cent mark and by 3 PM it had gone up to 58 per cent. At present, there are 209 candidates in the fray and 7.68 lakh voters to decide the 40 winners to the legislative assembly. The incumbent Congress as well as the hopeful Mizo National Front (MNF) have fielded 40 candidates each. The Bharatiya Janata Party (BJP), hoping to make a dent in the state, has fielded 39. The Zoram People’s Movement (ZPM), an amalgamation of the Mizoram People’s Conference, the Zoram Nationalist Party and the Zoram Exodus Movement has fielded 35. The People’s Representation for Identity and Status in Mizoram (PRISM) has fielded 13 candidates, the National People’s Party (NPP) 9, the Nationalist Congress Party (NCP) 5 and Zoramthar 24. Also Read: Bru Issue Behind the CEO Controversy in Mizoram? 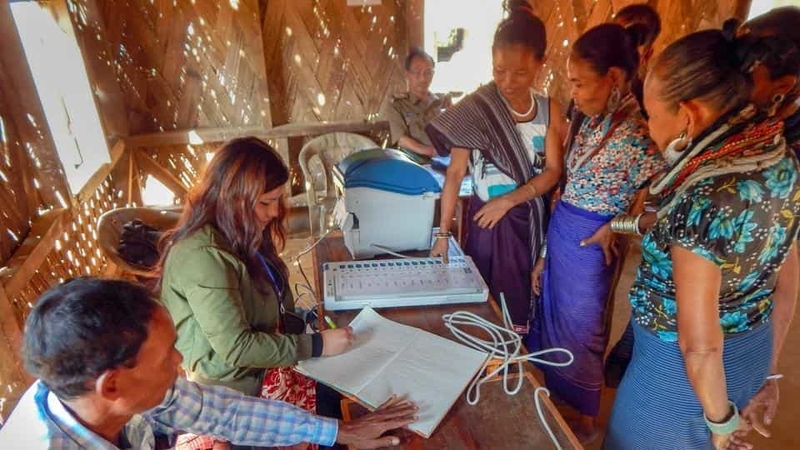 In accordance with the 2014 agreement between the government of Mizoram and the Election Commission of India, Bru voters who have been residing in the transit camps in Tripura cast their votes in Mizoram. The Bru voters were transported to Kanhmun village along the Mizoram-Tripura border where special polling booths were set up for them. There are 11,232 Bru voters among those residing in the transit camps. Also Read: How Has Mizoram Voted Since Statehood? The MNF is hoping that the voters will stick to Mizoram’s voting traditions – two terms for Congress followed by two for MNF. The Congress has been facing criticism from the MNF for lifting the liquor ban in the state. When the Congress lifted the ban in 2014, it was aimed at regulating rather than completely doing away with restrictions on consuming liquor. The liquor ban had been introduced in 1997 by the Congress government in the state, in deference to the Church’s wishes. Another issue that has affected the Congress’s standing has been the New Land Use Policy (NLUP). The policy was aimed at weaning people away from jhum cultivation and to encourage market-oriented farming. In 2015, through a government audit, it came to light that the funds earmarked for bamboo cultivation had ‘vanished’. Irate farmers descended on Aizawl in protest against this revelation. However, lady luck smiled on the Congress just ahead of the polls during the controversy over the Chief Electoral Officer (CEO), S B Shashank. During the civil agitation for Shashank’s ouster, the incumbent Chief Minister, Lal Thanhawla had written to the Prime Minister as well as the Union Home Minister regarding the impasse between Shashank and the Principal Secretary (Home) Lalnunmawia Chuaungo. The letter gained much publicity, which perhaps boosted the Chief Minister’s image in the eyes of the Mizo people who were gripped with nationalistic fervour. Perhaps, another bonus in this fiasco was that Shashank was replaced after consultations with state government officials and civil society groups. There has been speculation that in the case of a hung assembly, the BJP and the ZPM will play the role of king-makers. However, since 1993, the BJP has never gained more than 3.11 per cent of the valid votes cast. Therefore, it may end up becoming a three-way contest between the Congress, MNF and ZPM. In this instance, the title of king-maker more appropriately should go to the ZPM. Elections 2019: Are Tribal Votes Slipping from BJP in Madhya Pradesh?